Yesterday The American Library Association announced its 2013 book award winners, which left us at the Brown Bookshelf happy dancing all over the place. 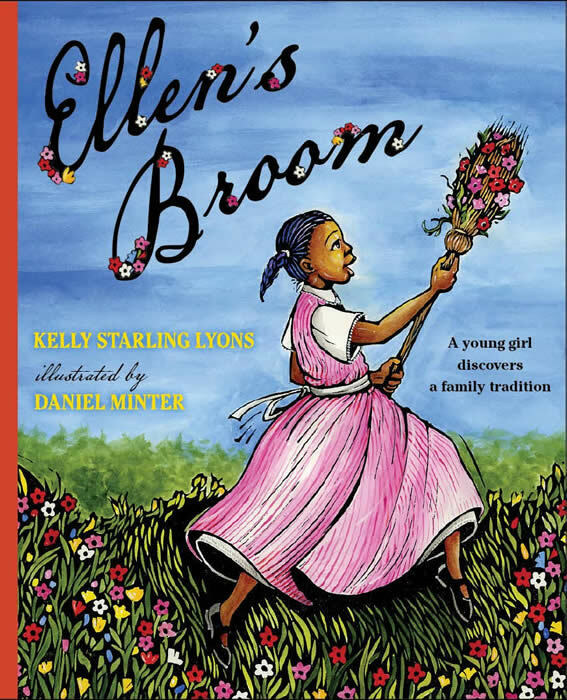 Ellen’s Broom, written by Kelly Starling Lyons, one of the Brown Bookshelf’s founding members, received a Coretta Scott King Illustration Honor. Daniel Minter, featured next month during our 2013 28 Days Later campaign, is the brilliant illustrator of the book. While we are happy for every book that was honored yesterday, we are especially happy and proud for Ellen’s Broom. Join me in congratulating Daniel and Kelly for a job well done. “Hand in Hand: Ten Black Men Who Changed America,” written by Andrea Davis Pinkney and illustrated by Brian Pinkney, published by Disney/Jump at the Sun Books, an imprint of Disney Book Group. “No Crystal Stair: A Documentary Novel of the Life and Work of Lewis Michaux, Harlem Bookseller” by Vaunda Micheaux Nelson, illustrated by R. Gregory Christie, published by Carolrhoda Lab, an imprint of Carolrhoda Books, a division of Lerner Publishing Group, Inc.
“H. O. R. S. E.,” illustrated and written by Christopher Myers, published by Egmont USA; “Ellen’s Broom,” illustrated by Daniel Minter, written by Kelly Starling Lyons and published by G. P. Putnam’s Sons, a division of Penguin Young Readers Group; and “I Have a Dream: Martin Luther King, Jr.” illustrated by Kadir Nelson, written by Martin Luther King, Jr. and published by Schwartz &Wade Books, an imprint of Random House Children’s Books, a division of Random House, Inc.
Congratulations to all the award winners! I’m doing a very energeitc happy dance for Kelly, who is an amazingly generous writer. So happy for Daniel and Kelly! ELLEN’S BROOM is a fantastic book. Congratulations, Kelly and Daniel! Looking forward to reading this wonderful book! Don, thanks so much for the awesome post. Really appreciate your support. I’m so happy for Daniel and thrilled Ellen’s Broom was honored. Thanks, Gwen! You were there from the very start at Chautauqua. Wow. Thanks for always cheering me on. Thank you, Tee! Appreciate you. Crystal, Thanks so much for your support. Congratulations to all. Also of note was the selection of Andrea Davis Pinkney for the May Hill Arbuthnot Honor Lecture Award. This award is an given annually to a person who has made significant contribution to children’s literature. I look forward to her speech!